About 2,400 Illinoisans are on electronic monitoring as a condition of their release from prison. 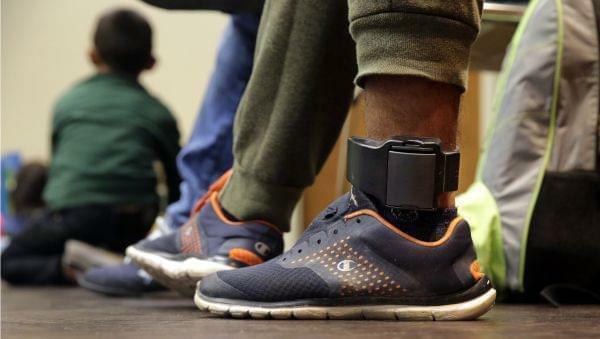 But some people say these ankle monitors actually make it harder to re-enter society. And, we’ll learn about the world’s fastest supercomputer. It’s going to be built at Argonne National Labs with help from the Department of Energy. Plus, a new play at the Goodman Theatre in Chicago takes on the decline of manufacturing jobs and tells a very personal story of its consequences. Over the past few years, more than 600,000 people in America have been released from prison a year. And before they’re fully released, many have to fulfill the conditions of their mandatory supervised release, more commonly known as parole. For nearly 2,400 people in Illinois, parole comes with an electronic monitor. They’re usually devices that are strapped to the ankle and track someone’s location. Advocates, including people who’ve been on electronic monitoring themselves, say these monitors actually make it more difficult to re-enter society. And they’re pushing for legislation to overhaul the state’s monitoring program. Augie Torres lives and works in Chicago and was on electronic monitoring for 60 days after being released for prison. He’s one of the advocates calling for a change to this system. Lee Gaines also joined us. She's been reporting on this for Illinois Newsroom. Representative Carol Ammons is a Democrat representing Illinois' 103rd district which includes Champaign-Urbana. She joined us in the studio. "We were never told why...years later I was told it would reduce recidivism, but there's no definitive data on that." - Augie Torres on why he got an electronic monitor after leaving prison. Argonne National Laboratories in Lemont will soon been home to the world’s fastest supercomputer, which has been nicknamed ‘Aurora.’ When completed in 2021, the supercomputer will be able to make a billion, billion calculations per second. Mike Papka is the director of the Argonne Leadership Computing Facility and he joined us for more. A new play at the Goodman Theater in Chicago - explores the very human consequences of what happens when factory workers get replaced. Lynne Nottage’s Pulitzer Prize winning play, Sweat alternates between the years 2000 and 2008 and explores many themes including race, class and immigration, when a Pennsylvania factory town goes out on strike. Now Sweat arrives in Chicago for the first time at the Goodman Theatre. You can see it there until April 14th but, in the meantime, we spoke with director Ron "OJ" Parson recently at the Goodman in Chicago to talk to him more about the play. Sweat explores the intersections of both race and class, but Parson says everyone can find a piece of themselves in the characters. "I like when audiences are able to tap into different things. It's not one thing that you're going to come and see and think about."